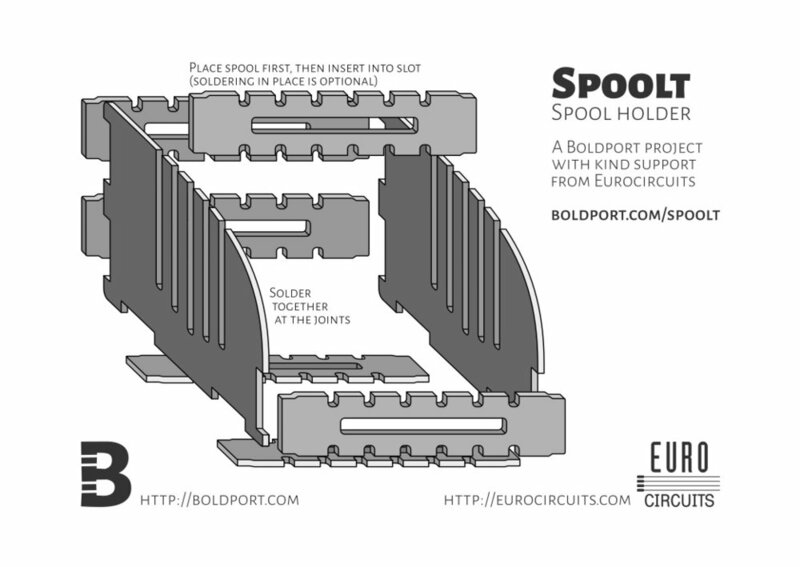 Once assembled SPOOLT will hold one or more solder or other wire spools and will look amazing while doing it. The project contains two rib and six bar circuit boards. Also included is a card for crafting a spool. This was a collaborative project with Eurocircuits who supported it financially. SPOOLT was project #15 of the Boldport Club. Make a card spool. A printable PDF is available here. It's quite straightforward. Make sure that the pieces are soldered flush with the edges, particularly the bottom two bars so that there is maximum contact with the surface; this helps against the thing moving as you pull on the solder. The 3mm holes can be used to affix the holder to a surface using screws or cable ties. Here's a PDF for making more card spools.